Northumbrian water has installed a gas to grid plant in Howden, North Tyneside at a cost of £8m. The plant will be used to inject gas captured from digesting sewage onto the grid. The grid plant is currently in the final stages of commissioning. In a project nicknamed ‘Power from Poo’, Northumbrian Water has been generating electricity from the sewage treatment for more than three years, by utilising the methane gas released by bacteria digesting the sludge to drive turbines, in turn creating electricity. The sludge is pre-treated after sewage treated by heating it to 165 degrees Celsius under six bars of pressure. At this stage, pathogens are destroyed and cell structures are broken down, making it easier for the bacteria to digest. Prior to the gas then entering the grid, it is cleaned in water towers to remove impurities. Propane is also added prior to injection so that it matches gas currently on the grid. Artificial odour chemical Butyl Mercaptan is also added to the naturally-odourless gas to give it its characteristic smell for safety reasons. When commissioned, the gas to grid plant is expected to produce up to 88 million kilowatt hours of renewable energy per year, which is enough to meet the gas requirements of 5,000 homes. The £3m annual efficiency attributed to the plant will aid Northumbrian Water in maintaining amongst the cheapest bills in the utilities industry. 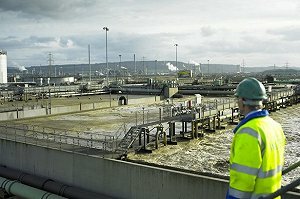 Northumbrian Water’s Wastewater Director, Richard Warneford, commented: “We are now able to produce both gas and electricity. More than 20% of our total power use is now from renewable energy sources including hydro power at our treatment works and reservoirs like Kielder Water. The gas to grid plants is anticipated to be at 100% flow over the coming few months.